CLICK HERE for more photos by Julio César Gamallo. Photo above used with permission. Thursday morning, March 11, 2004: A Black & Bloody Day in Madrid's History. The morning was like any other morning on Madrid's trains; people going to work & students going to school. The people riding these trains were mainly working class people, many of them immigrants, coming into Madrid city from working class neighborhoods. They were people, living & breathing human beings, just trying to make a living or to better their lives. THEN it happened. The next 30 minutes would change their futures forever. And in the case of nearly 200 individuals, their futures would be erased. Women, men, children, babies, & unborn babies all lost their lives on this black day near 3 of Madrid's train stations where bombs were seemingly detonated remotely by terrorists. Who is responsible? Does it matter? Yes. It matters. But finding & prosecuting those with hate in their hearts will not return the futures to those lost forever on March 11th, 2004. I, MadridMan, feel an inexplicable loss for the people of Madrid and all citizens of Spain. MY life has also been changed forever. But the reality of this situation is that MY feelings, fears, are miniscule compared to the loss felt by the families of those nearly 200 victims and the painful recovery of 1,600 more. My pain is within me and no one else can share it in the same way. One regret is that I am not IN MADRID to at least attempt to comfort those whom have felt a direct loss and to participate in any and all efforts to see that this tragedy does not occur again. There is no absolutely safe place on this earth from terrorism and I beg those planning or contemplating a trip to Spain in the future to KEEP YOUR PLANS. If you cancel your plans the terrorists have achieved their goal - they win. PLEASE do not turn your backs on Spain now. She needs you now more than ever. 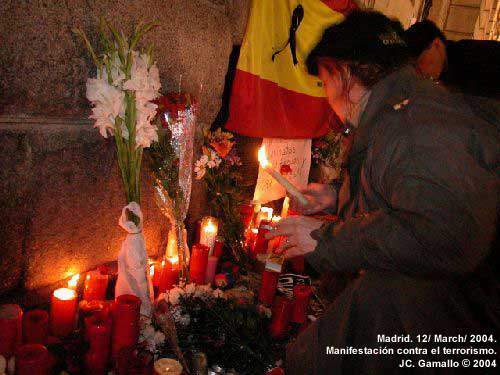 Read MadridMan's blog entry (March 11, 2008) entitled, "11 March 2004 Madrid Train Bombings Anniversary".